From time to time, we have rescue that we take in since their owners could no longer take care of them. All rescue are health checked and temper tested before we agree to bring them here, after which we put them in a room off away from our rats for a month and a half to make sure they are healthy and not getting our Rats Sick. 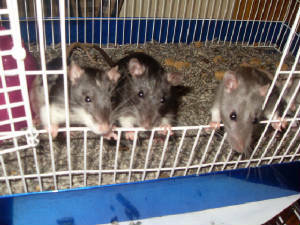 If you have any questions or can no long take care of your Rats please contact us. Currently we have 8 rescues. 4 males and 4 females, all litter mates, and about 6 months old. All are healthy and love, and even social! All have up ears and their are several different colors and patterns (silver mink, silvered black, and dove blue). If intereted in adopting please email us!